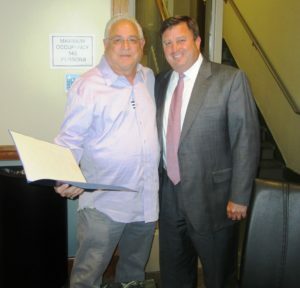 Jon Cohen, co-owner, Harry’s Restaurant, (l) accepts a proclamation from Ian Johnson, chair, Westborough Board of Selectmen. 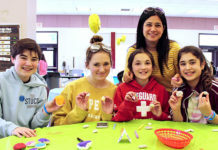 Westborough – Two local businesses were honored during the Westborough Board of Selectmen’s May 24 meeting. Jon Cohen, who owns Harry’s Restaurant with his wife Linda, accepted a proclamation of congratulations from the Board on the occasion of the restaurant’s 70th anniversary. Harry’s, located on 149 Turnpike Rd (Route 9 West), was opened by Cohen’s parents, Harry and Eleanor, in 1946. Since that time, it has become an iconic local establishment. Another longtime Westborough business, E.L. Harvey & Sons, was presented with the town’s Stormwater Management and Quality Water Award. 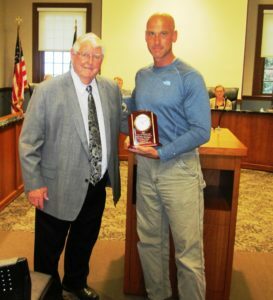 Derek Saari, the town’s conservation officer, presented the award to Jim Harvey, CEO and treasurer of E.L. Harvey & Sons. Located in Westborough, on the Hopkinton border, Harvey’s is a full service waste hauling, transfer, and scrap recycling operation. As such, Saari noted, they must do a great deal of monitoring of their operations to comply with state and federal mandates. The company, founded in 1911, serves as the town’s recycling and trash disposal drop-off facility. In other business, the board appointed Gary Gregory to the Historical Commission and Katie Welch to the Country Club Operating Committee and reappointed June Hudnall as a registrar of voters. Jim Harvey, CEO and treasurer, E.L Harveys & Sons (l) receives the town’s Stormwater Management and Quality Water Award from Derek Saari, the town’s conservation officer.